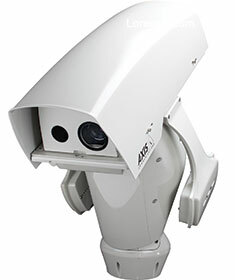 The Q87 Bispectral PTZ network camera series from Axis Communications offers a combination of visual and thermal video streams in a single PTZ camera for border surveillance and other applications. You need just one camera and one IP address to benefit from long-­distance thermal detection, visual identification and PTZ capabilities. The Q87 lets operators choose between really slow or super-fast pan (from 0,05 to 120 degrees per second) and tilt movement (from 0,05 to 65 degrees per second). This delivers smooth and jerk-free panoramic viewing when needed and can respond quickly to events. With thermal zoom models, you get 3X thermal zoom, allowing you to detect a human as far as 3 km. • One view – two bispectral video streams. • Detection, verification and identification. • 360° endless pan and 135° from ground to sky.